MORE than 170,000 migrants flooded into Europe last month alone as the continent's unprecedented refugee crisis continues to spiral out of control. There were almost 6,000 new arrivals EVERY DAY in September as frontline EU states buckled under the weight of record numbers fleeing war and poverty. And the statistics may even be vastly underestimating the scale of the crisis, because nearly 100,000 migrants displaced by EU states' panicked decisions to shut their borders have not yet been fully accounted for. Today a British politician claimed that the shocking numbers - released by the EU border agency Frontex - were the product of Germany's controversial policy of welcoming new arrivals with open arms. Official statistics show that more than 710,000 migrants have arrived in Europe so far this year, around the same number as the population of Leeds. The number of people pouring in is already nearly three times as high as for the whole of 2014, with another three months of this year still to go. However, just over half of those claimed asylum in the first EU country they arrived in, fuelling suggestions that many people are economic migrants seeking a better life in northern European states. The past five months in a row have all set records for the numbers of migrants arriving in the EU, with the ongoing crisis showing no signs of abating. Almost all want to live in Germany and there have been violent clashes in Greece, Hungary and Croatia in recent weeks as tensions between migrants and police boil over. 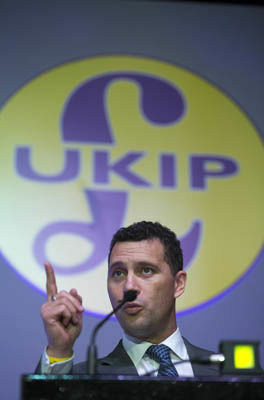 Reacting to today's figures UKIP migration spokesman Steven Woolfe blamed German leader Angela Merkel for the crisis, saying her promise to grant automatic citizenship to refugees had encouraged more people to make the perilous journey. He raged: "Her statements were interpreted as a call to action by economic migrants and refugees alike across the Mid-East and northern Africa to up sticks and make the trek towards German cities. 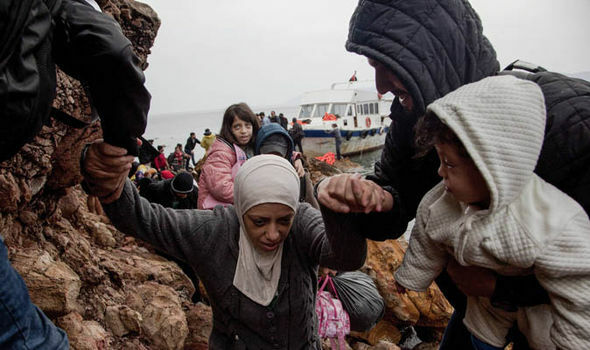 "The truth is that many left safe environments in refugee camps in Turkey or Jordan. Not comfortable by any means but certainly not life threatening. "What’s more, now that migrants have found safer land routes to the EU through Turkey, their numbers will not be diminished much by the winter weather. “Germany’s citizens are beginning to realise that their strong leader has made a colossal historic mistake." 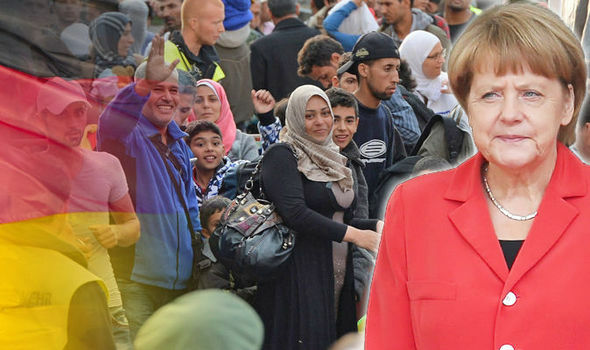 He added that almost none of the migrants arriving in Germany can speak the language and alluded to recent reports that cultural tensions are already rising in neighbourhoods affected by huge influxes of largely Muslim newcomers. The Frontex figures also revealed the scale of the challenge facing front line Greece which has been inundated with 350,000 migrants already this year - 49,000 of whom arrived last month alone. Migrants are now increasingly choosing to make the short crossing from Turkey rather than risking the more perilous journey to Italy from Libya which has seen thousands drown at sea in rickety smugglers' boats. Hungary, which has built a giant fence to keep migrants out, reported that 204,000 people have crossed its borders this year without passports or visas - a 13-fold increase on 2014. 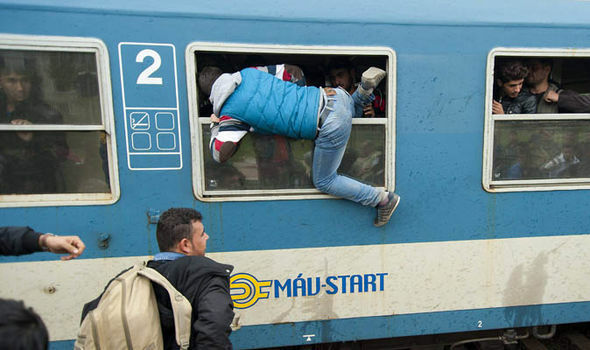 Frontex admitted that its September figures did not include an estimated 97,000 people who entered the EU in Croatia in the second half of last month after Hungary sealed its border southern border. The deepening migrant crisis has opened up huge rifts between EU leaders and has brought the free-movement Schengen agreement to the point of collapse. Speaking ahead of a meeting between EU leaders to discuss the crisis, Frontex executive director Fabrice Leggeri said: "Urgent assistance is needed, especially for Greece and Italy, to help register and identify the new arrivals. "I do hope we receive adequate contributions which will show the true spirit of European solidarity."